We have started on a new regime for 2017, there is a significant birthday this year for my OH and we wanted to ensure that we dealt with our ever increasing waistlines and health. To be honest no real health issues, we just know that we should be eating healthier and this is a perfect time to start. We are following the 8 Week Blood Sugar Diet, it is a Low Carb diet, however it is also restricted calories – 800 per day, give or take a few on a daily basis, as it will balance out over the week. This is a new way of eating and cooking, I need to consider all of the ingredients ensuring that we have healthy balanced meals with protein and carbs, but healthy carbs, yes you can use fat, however fat is calories so too much butter, olive oil, coconut oil, etc all add to the daily total of calories and reduce the ingredients we can eat. There are a number of great resources on the internet for recipes, calorie counting/calculating, tables with carb values of meats, vegetables and fruit so it is about finding the ones that are useful and stick to them. I am currently using MyfitnessPal to load recipes and calculate calories. It has been helpful, quick and easy to use although you need to signup there is no charges, you can load recipes, get the nutritional information and also it has a food diary so I can see the calories I have used everyday. 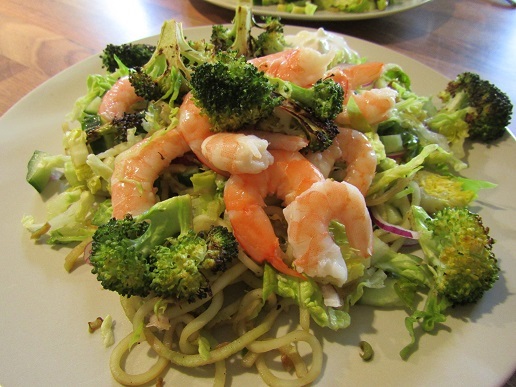 This recipe is a great recipe for using all of the broccoli, even the stem, if you haven’t already got a spiralizer, then please consider investing in a sprializer, not expensive and quick and easy and we find we eat a lot more vegetables. There are loads on the market, have a look for the one that suits you and your budget, this is the one we use. I started with preparing the broccoli, I used a 500g piece of broccoli and took the florets off the stem and then cutting them, not too small, I like to have a cut edge on the floret so this can get nice and crispy in the oven. I added the florets to a bowl, they weighed 230g (all for the calculation) then I drizzled with some olive oil and tossed the broccoli around, so that it was coated in the oil. I then seasoned with salt, lemon zest and a squeeze of lemon juice, gave it another toss and then layed it out onto a large oven tray. I like to make sure that there is a lot of space around the florets and that the oven is really high, it gets the cooking started quickly and you get that great charring on them. While they were in the oven, I turned to the stem, you need to clean it up a bit, just trim off any dirty bits. Then its about getting those spirals. I have found that if you place the end of the stem, where it has been cut from the ground, it is easier to work through the spiralizer, to be honest there is no right or wrong, it is just my preference. We were also having prawns with this dish, it will work well with any protein, I cleaned the prawns and placed them in a bowl until I was ready with everything else. 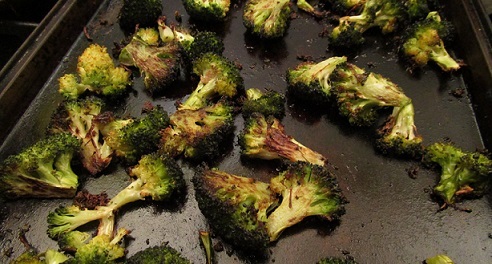 I checked the broccoli in the oven, it was charring up nicely, they usually take about 15-20 minutes to get all nice and crispy, just keep an eye on them and toss them around on the baking tray so that you get some colour all over. I finely sliced some baby gem lettuce, cucumber and red onion. When the broccoli in the oven was just about there, I fried the spirals of broccoli stems, heated 1 tsp of olive oil in a frying pan and added the spirals, no real need to ‘cook’ them as such, just to warm them through 2-3 minutes will do the job. Now it was all about assembling everything. I tossed the lettuce, cucumber and red onion in a bowl then I added the spirals of broccoli, I did cut them a bit as they do have a tendency to spring back together (a bit like a slinky) then dressed the plate with the salad, topped it with the prawns and then the roasted broccoli florets, a dollop of Greek yogurt on the side and dinner is served. We thoroughly enjoyed our meal, yes we are following the Low Carb diet, but this is a delicious meal even if you are not following any diets. 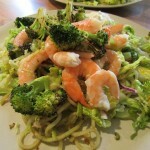 Delicious dish with prawns and a warm salad, making the most of the broccoli stem and a spiralizer. Great low carb dish, perfect for lunch or main meal. Pre-heat the oven to 240c conventional/220 fan/gas 9. Cut the florets off of the broccoli and cut again, then place in a bowl and 1 tsp of olive oil, the zest of the lemon and 1 tsp of lemon juice. Toss them in a bowl and then tip out on to a large baking tray. Space the florets out so they have space to roast rather than steam. Place in the oven and roast for 15-20 minutes, occasionally checking and tossing around to get good colour all over. Clean the prawns, removing the shells and de-veining, place in a colander , rinse and leave to drain while you get the rest of the ingredients prepared. Take the stem of the broccoli and clean off any dirty bits, then cut into 'spaghetti' using the spiralizer, I usually place the cut end (from the ground) onto the cutting blades, I find it easier for getting the most out of the stem. It worked out that I got 250g of broccoli-etti and 230g of the florets, really making the most of this delicious vegetable. Cook the spirals for 2-3 minutes. Clean and thinly slice the lettuce, cucumber and red onion and place them into a bowl. Toss them to mix through. When the broccoli florets are nearly ready, add 1 tsp of olive oil to a frying pan and fry the broccoli spirals, I cut them a bit just to make it easier for tossing in the salad and splitting on the plates. When the broccoli spirals are ready, toss them into the bowl with the other salad ingredients and mix through. Add a squeeze of lemon juice and toss again. When you are ready to plate up, split the salad between your plates, then add the prawns on top and then the broccoli florets. Add 1 tbsp of Greek yogurt to each plate.